The authors report on a new electrochemical aptasensing strategy for the determination of adenosine - 5’-triphosphate (ATP) at picomolar levels. First, manganese dioxide (MnO2) nanosheets with an average size of ~70 nm were synthesized via a hot-injection method on the basis of reaction between potassium permanganate and the cationic detergent cetyltrimethylammonium bromide. The resulting MnO2 nanosheets were then immobilized onto a pretreated screen-printed carbon electrode which readily binds the ferrocene-labeled ATP aptamer through the van der Waals force between the nucleobases and the basal plane of the nanoflakes. The immobilized ferrocene-aptamer conjugates activates the electrical contact with the electrode and produces a strong signal in the potentials scanned (0.0 to 1.0 V vs. Ag/AgCl). Upon addition of ATP, it will react with the aptamer and cause the dissociation of the ferrocene-aptamer from the nanosheets, this resulting in a decrease in the electrical signal. Under optimal conditions, this platform exhibits a detection limit as low as 0.32 nM of ATP. The repeatability and intermediate precision is below 10.7 % at a 10 nM concentration level. The method was applied to analyze blank fetal calf serum spiked with ATP, and the recoveries (at 3 concentration levels) ranged between 91.3 and 118 %. This detection scheme is rapid, simple, cost-effective, and does not require extensive sample preparation or multiple washing steps. 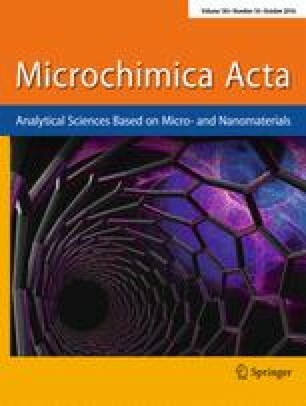 MnO2 nanosheets are used as the sensing platform for electrochemical detection of ATP based on target-induced dissociation of ferrocene-labeled aptamer. The online version of this article (doi: 10.1007/s00604-016-1916-2) contains supplementary material, which is available to authorized users. Support by the National Natural Science Foundation of China (41176079 & 21475025), the People’s Livelihood Science and Technology Innovation Project of Chongqing City (cstc2016shmszx20001), and the Advanced Natural Science Foundation of Chongqing City (cstc2015jcyjBX0126) is gratefully acknowledged.